It’s not uncommon to find the fitness centre in Holland College’s Centre for Community Engagement comfortably full of people working on the various weight machines, bikes, and ellipticals, or to glance through the window onto the running track and see people of all ages walking and running, their earphones clamped firmly to their heads. But when Holland College and the Seniors College teamed up recently to offer a series of fitness classes dubbed Let’s Get Physical, the balance tipped a little more toward the higher end of the age scale. About two dozen seniors took part in the classes, learning more about their own fitness levels, about how to properly use the equipment, and what sorts of fitness activities were of most interest to them. In addition to the workout equipment, the group has participated in Kettleball, Pilates and Zumba classes. Joseph Mahar, a second year Sport and Leisure Management student, has been working with the seniors over the past few weeks. He said that while they are enthusiastic about trying new things, they are a little more hesitant than some of the younger members of the gym. The participants have been enjoying the sessions. Maria Dowling, a retired project manager and a volunteer board member for the Seniors College, said the class was a popular offering. “The course introduced us to a variety of exercises. Many people had never used gym machines or tried Pilates, Zumba, or Kettle bell. The music at the Zumba class made us dream of a Caribbean cruise! What a great way to workout and have fun. Some seniors are now dropping into lunch hour classes at Holland College to stay active,” she said. For over 13 years, the Seniors College of P.E.I. has been offering a wide range of courses to anyone aged 50 and over. In 2013-14, more than 140 courses were offered in and around the Summerside, Montague and Charlottetown areas. Courses include topics such as computers, drawing, painting, literature, music, cooking, local history, hiking, yoga and much more! Emphasis is on personal growth in a casual, friendly atmosphere that encourages social interaction and having fun. For a registration fee of $152, college members are entitled to sign up for an unlimited number of courses over the fall, winter and spring terms. Seniors College is a volunteer-operated non-profit organization and membership fees are used solely to cover operating costs. 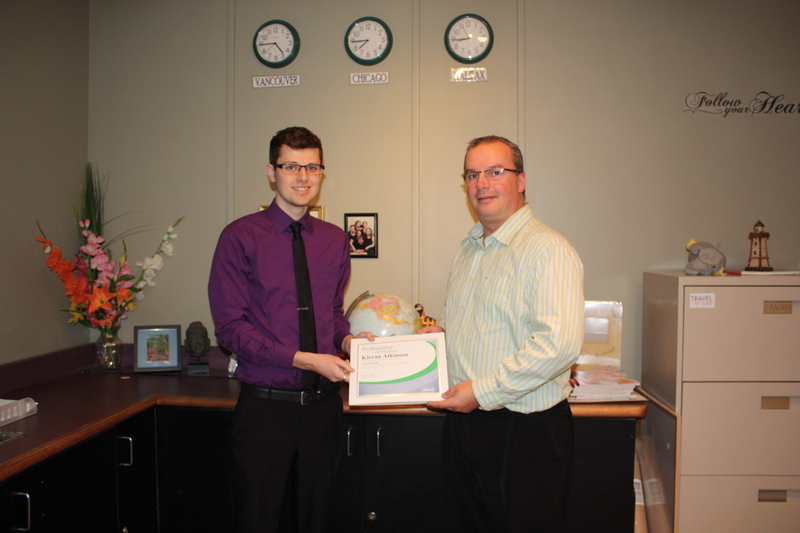 Second-year student Kieran Atkinson accepts his emerit certificate from Rod Clark, emerit coordinator for TIAPEI. Congratulations to Kieran Atkinson, a second-year student in our Tourism and Travel Management program, for earning his emerit certification as a tour guide. In addition to writing an exam, Kieran had to complete 60 hours of tour guiding experience. He also worked, for the second year, on the Points East Tulip Festival. emerit Certifications provide employers with the confidence that an employee has the appropriate training for a position in the tourism and travel industry. In Prince Edward Island, th Tourism Industry Association of P.E.I. (TIAPEI) is the official supplier of emerit products and services.